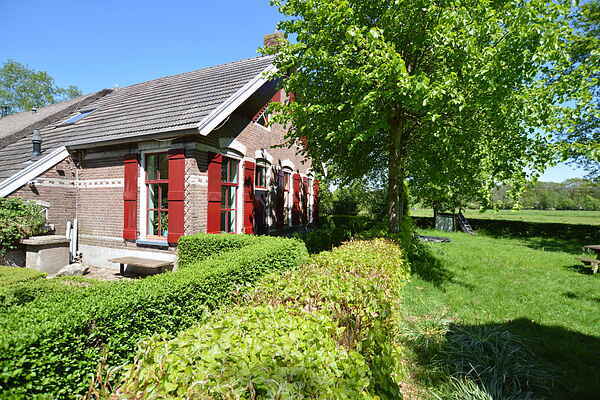 A holiday house in the countryside outside Dwingeloo, ideal for nature lovers and anyone seeking peace and quiet. This is the front house of a converted 100-year-old farmhouse. From the living room and kitchen you have a view of the orchard and the adjacent pastures. The holiday house is located next to an organic berry farm. In the summer months you can pick fresh blueberries. You can go on walking and cycling excursions to the Dwingelderveld, the Leggelderveld, the Drents-Friese Wold and the Blauwe Meer. This is also a great area for horseback riding. You can do your daily shopping in Dwingeloo (5 km). You will find a variety of shops and restaurants there, as well as an astronomical observatory with a museum (the Planetron), and an outdoor pool. You can also go swimming in the Blauwe Meer, an excavated lake with yellow sandy beaches in a sheltered setting in the Leggelderveld forests. This is a house with lots to offer in an area abounding in nature and recreation.